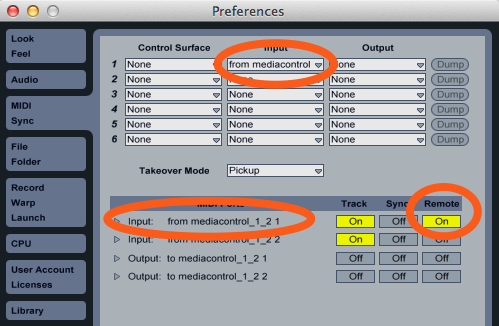 MediaControl is the NETLab helper application that handles control of external media such as sound and lighting. The current version supports communication with MIDI and the DMX lighting protocol. Communications with MediaControl are made through the OSC protocol. MediaControl can also be used independently of the rest of the NETLab components by sending OSC to it directly. To use it for DMX lighting, you must have the Enttec DMX USB Pro interface. In the NETLab Widgets, use the DmxOut widget. If the DMX USB Pro is attached correctly, MediaControl will recognize it, and automatically connect to it. To test your DMX connection, select the “open dmx faders” button in MediaControl, and a new window will open with a set of 16 faders. Once you are sure you are communicating will your DMX devices, use the DmxOutput widget in Flash. 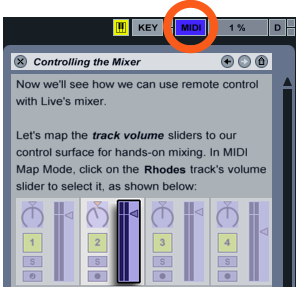 In Live, you’ll need to use the MIDI Map Mode Switch (see below screen capture) to assign a particular key or controller message to something on a specific element in Live. See the help sections on “Creating Manual MIDI Mappings” and “Controlling the Mixer” for more info about this. For MIDI hardware, select the appropriate piece of hardware in Media Control. You can then test with the on-screen keyboard for making notes, and the controller slider for sending MIDI control messages.